Rebecca is a knowledgeable and trustworthy family law attorney assisting clients throughout Fresno, Kings, Madera, and Mariposa Counties. With a compassionate and tenacious desire to help her clients in what is often the most difficult time in their life, Ms. Medina carries herself with poise, a superior attention to detail, and the ability to relate to her clients on a level that conveys trust and inspires confidence. Rebecca’s philosophy is to provide her clients with what they need and are looking for in an attorney: experience, honesty, intelligence, and the ability to provide straightforward legal advice. Rebecca’s number one goal is to help her clients obtain the best results for their family law matter. Rebecca can assist with matters including: uncontested divorces, negotiations, child custody and visitation, child and spousal support orders, and highly complex divorce cases involving business valuations and complicated financial matters. She also can assist with courtroom appearances in any family law matter including domestic violence cases. 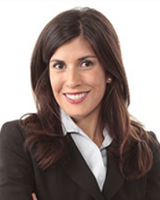 Rebecca Medina has the skills and resources needed to give your family law case a razor sharp legal edge. Rebecca is a Fresno native and came back home after law school to pursue her passion in family law. This passion stemmed from going through a divorce while in law school. Rebecca understands firsthand the emotional difficulties and life transitions that many of her clients are going through. Rebecca works hard for her clients and is responsive, prepared, and thorough. When Rebecca is not working, she enjoys spending time with her children, family/friends, running, and yoga. When your family is facing complicated legal issues of any kind, you need a family law expert who can help you sort through your situation with compassion and strength. Rebecca Medina is a Fresno family lawyer who can help you with divorce, spousal and child support, paternity, domestic violence and more. Under your stressful circumstances, you face some difficult and frightening questions. How will you get the financial support you need? Can you maintain custody? How will you protect yourself and your children from abuse? Who will help advocate your position in court? Rebecca Medina understands the complex and emotionally-charged world of family law in Fresno, California. She can help you get the answers, support, and legal backing you need to put things in order and move on with your life.